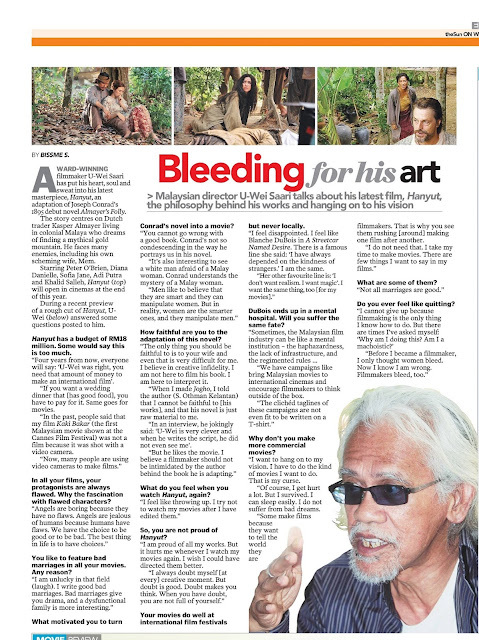 Award winning filmmaker U-Wei Saari has put his heart, soul and sweat into his latest masterpiece, Hanyut, an adaptation of Joseph Conrad’s 1895 debut novel Almayer s Folly. The story centres on Dutch trader Kasper Almayer living in colonial Malaya who dreams of finding a mythical gold mountain. He faces many enemies, including his own scheming wife, Mem. Starring Peter O’Brien, Diana Danielle, Sofia Jane, Adi Putra and Khalid Salleh, Hanyut (top) will open in cinemas at the end of this year. During a recent preview of a rough cut of Hanyut, UWei (below) answered some questions posted to him. * Hanyut has a budget of RM18 million. Some would say this is too much. Four years from now, everyone will say: ‘U-Wei was right, you need that amount of money to make an international film’. If you want a wedding dinner that [has good food], you have to pay for it. Same goes for movies. In the past, people said that my film Kaki Bakar (the first Malaysian movie shown at the Cannes Film Festival) was not a film because it was shot with a video camera. Now, many people are using video cameras to make films. *In all your films, your protagonists are always flawed. Why the fascination with flawed characters? *You like to feature bad marriages in all your movies. Any reason? *What motivated you to turn Conrad’s novel into a movie? *How faithful are you to the adaptation of this novel? The only thing you should be faithful to is to your wife and even that is very difficult for me. I believe in creative infidelity. I am not here to film his book. I am here to interpret it. When I made Jogho, I told the author (S. Othman Kelantan) that I cannot be faithful to [his works], and that his novel is just raw material to me. “In an interview, he jokingly said: ‘U-Wei is very clever and when he writes the script, he did not even see me’. But he likes the movie. I believe a filmmaker should not be intimidated by the author behind the book he is adapting. * What do you feel when you watch Hanyut, again? I feel like throwing up. I try not to watch my movies after I have edited them. *So, you are not proud of Hanyut? *Your movies do well at international film festivals but never locally. I feel disappointed. I feel like Blanche DuBois in A Streetcar Named Desire. There is a famous line she said: ‘I have always depended on the kindness of strangers.’ I am the same. *DuBois ends up in a mental hospital. Will you suffer the same fate? *Why don’t you make more commercial movies? I want to hang on to my vision. I have to do the kind of movies I want to do. That is my curse. Of course, I get hurt a lot. But I survived. I can sleep easily. I do not suffer from bad dreams. Some make films because they want to tell the world they are filmmakers. That is why you see them rushing [around] making one film after another. I do not need that. I take my time to make movies. There are few things I want to say in my films. *What are some of them? Not all marriages are good. *Do you ever feel like quitting? I cannot give up because filmmaking is the only thing I know how to do. But there are times I’ve asked myself: ‘Why am I doing this? Am I a machoistic?’ Before I became a filmmaker, I only thought women bleed. Now I know I am wrong. Filmmakers bleed, too.